Moving is a stressful time for anyone, but when you add the logistics of moving your business to a new location the pressure of a smooth move and the risk of costly office moving mistakes intensifies. Before your office move, make sure you have a plan and checklist to follow – The prep work leading up to an office move is just as important as what happens on moving day. Don’t let the details fall through the cracks and avoid making simple office moving mistakes. 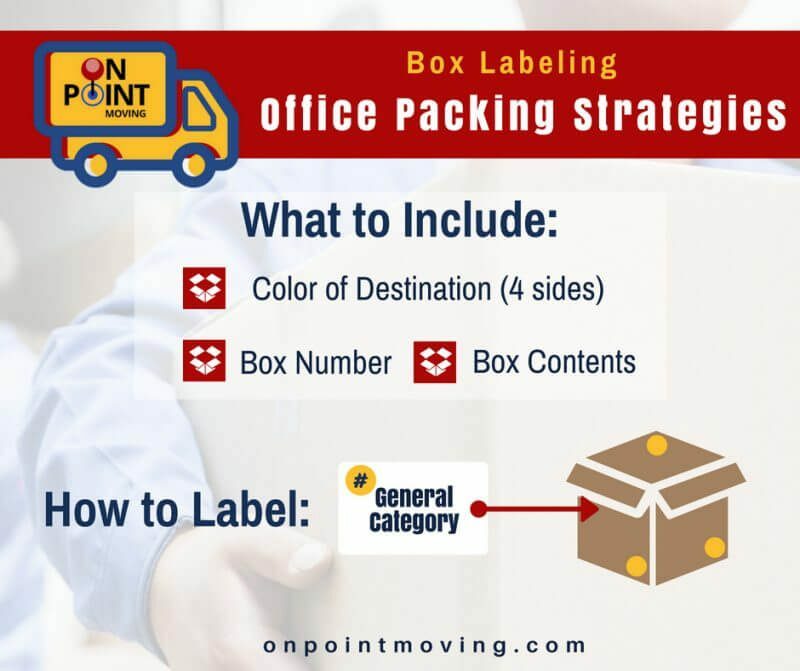 We have outlined the most common office moving mistakes that you can prevent to free yourself from stress and unnecessary costs related to your corporate move. Unnecessary costs and stress are easily avoided when you take the steps to plan your office move. Cut your office moving costs by avoiding costly office moving mistakes. Be proactive and have a plan in place for different scenarios during the move. Our top 10 tips to avoiding preventable, but all too common, mistakes will help catch holes in your moving plan before moving day comes around. The pros are trained, experienced in moving hacks and have the equipment to efficiently move an office. A team of movers will make quick work of your office that Gerry and Susan in accounting couldn’t pull off. Don’t underestimate your office move – it is hard work, especially without the proper moving equipment. A good mover will also help figure out the logistics of your commercial move. They can provide suggestions and map out a blueprint for your move to reduce time and effort spent on your move. When you let a pro figure out your move, you cut your office moving mistakes considerably. Not verifying your mover could easily become one of your biggest office moving mistakes. 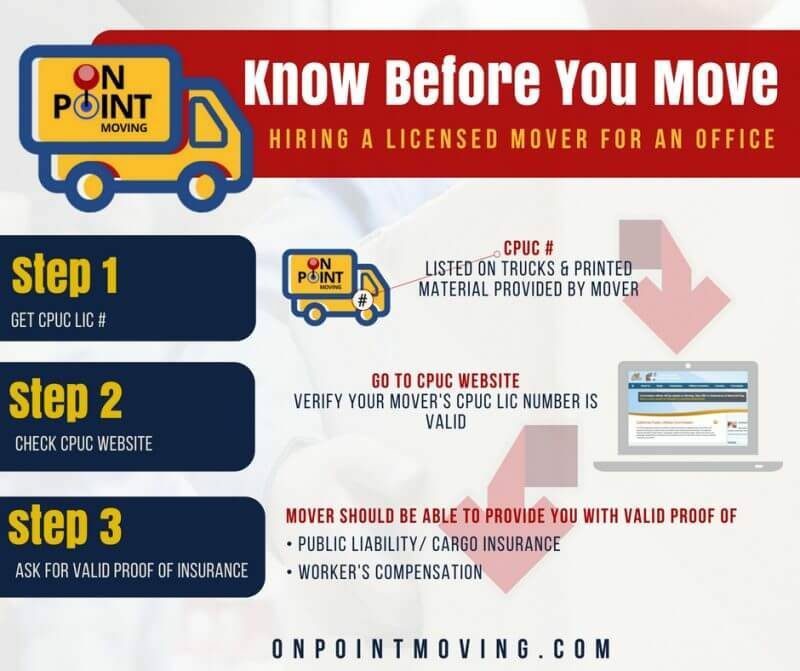 All legitimate moving companies will have been issued a license number from the CPUC and should have their CPUC license number and DOT number displayed on their moving trucks and printed materials that are given to the client. They will also be able to provide you with valid proof of insurance. You can can verify your mover’s information on the CPUC website. Hiring an unlicensed and uninsured mover can add a lot of liability to your corporate move that you do not want to take on. Get social proof; your peers have a lot to say and they are saying it on many different platforms. Reading reviews on Google and Yelp is an important part of the research process. 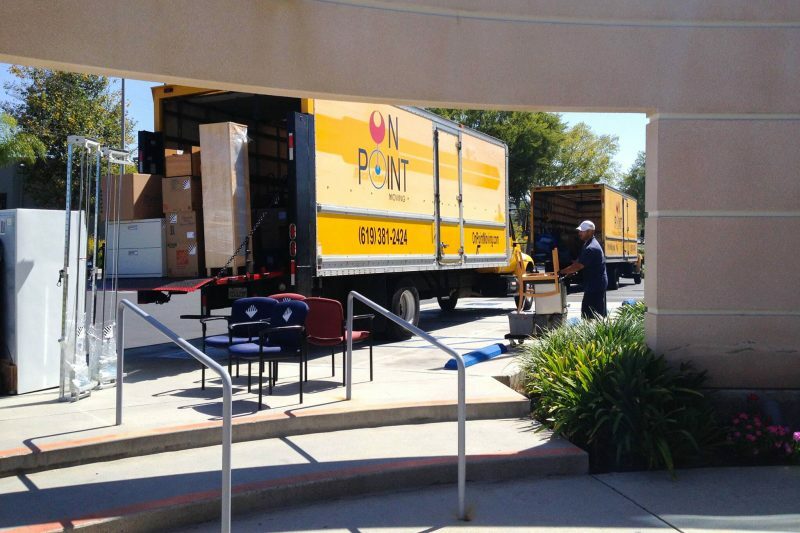 Just because a company is legit in the eyes of the CPUC does not mean that your moving company is a good one. Take the time to do your homework and outline what qualities you want in your mover – hiring a good mover is the easiest way to alleviate a hefty portion of stress from any office moving mistakes. Don’t move everything in your office – you don’t need all of it. 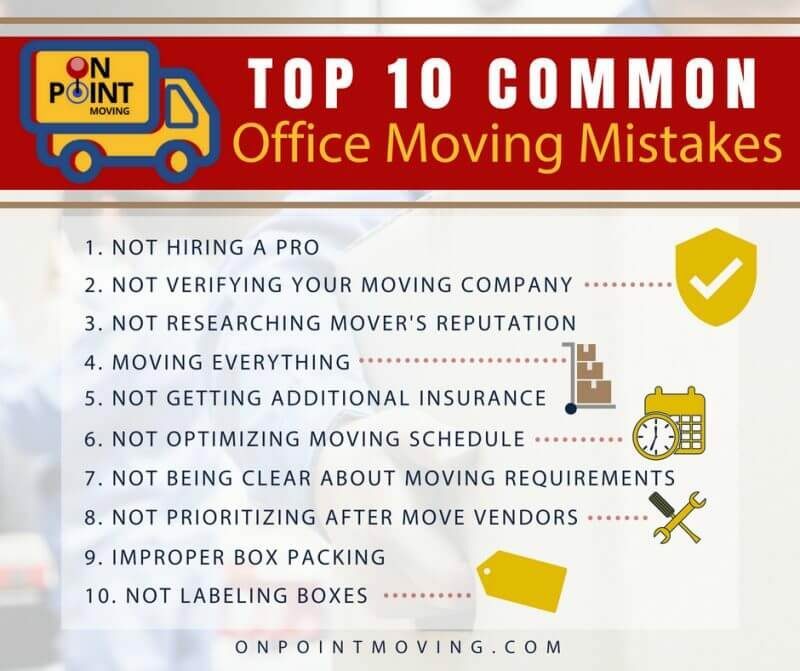 This isn’t just an office moving mistake, its a big mistake for all moves. Before the movers arrive, make sure you have gone through old documents that can be shredded and tossed. Recycle your electronics that are collecting dust in the supply closet. Keeping junk adds time to your move. The more that you have to move the more time and energy the movers will need to spend during the loading and unloading time. Sure, your moving company has insurance, but it may not be enough to cover everything. It is your responsibility to acquire additional moving insurance to protect your belongings. You can get moving insurance through your moving company or find additional coverage from your own insurance company. The choice is yours, but additional moving insurance should not be considered optional; accidents happen and some damage, no matter how careful a mover is, can be expected during the moving process. It may make sense to start your move at the end of the workday, but rush hour moving will add costs to your move because of Double Drive Time (DDT) laws. A commute that takes 30 minutes without traffic can easily turn into a 2 or 3-hour drive; because movers are legally required to bill DDT, that can add a hefty sum to your final moving bill. Plan to have your movers on their way to the new location during down times in traffic – this means not during morning or afternoon rush hour and in some cases, the lunch rush should be avoided. A professional moving company will be flexible and understands any downtime during operational hours is money lost. Scheduling during the workday is often not an option. If after-hours moving is your only option, make sure both buildings are aware of your move so you have full access to the building’s elevators, stairs, parking lots, and doors. One of the costliest office moving mistakes you can make is having movers sit around waiting for a building to be accessible. Keep your move productive and moving by taking schedules into consideration. Let your movers know if there are special requirements for them to know before the move. Is there an accessible elevator? Will there only be stairs at either the origin or destination of the mover? Is the only access in a narrow alleyway? These are logistical challenges that your mover needs to account for. Surprises on moving day will likely result in a change order which translates to higher moving costs. Your mover can only do so much to help facilitate a smooth transition from one office to another. Your moving company will do all of the heavy liftings, but you are not completely off the hook – operational functions should be in place before your employees walk into the new office. Did you schedule your IT or Internet Service Provider before computers came in? Are the phone lines up and running? Utilities? Have those been turned on? What can your office work without and what absolutely needs to be in place before your employees come in? Schedule your vendors in that order for a seamless transition with the least bit of downtime as possible. Damage to your items is more likely if you have packed your boxes improperly. Many people only buy one size of moving boxes. This is not just an office moving mistake – it’s an overall moving mistake. The problem is that packing huge boxes that are too heavy to move will likely result in injury. Furthermore, boxes that are only filled half of the way up cause stability issues for your belongings during the commute to the new office. Boxes collapse in or lean – damage that is completely preventable by packing a box with proper technique and using a variety of sizes to accommodate different belongings. You may be packing items that are considered hazardous materials. Did you know movers can’t move everything. 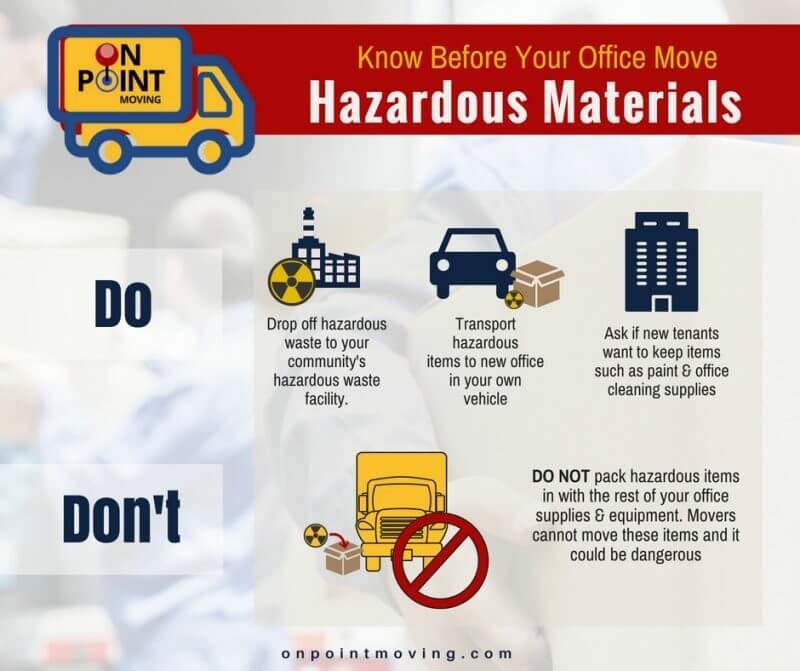 Know what is considered hazardous materials and what your mover won’t be able to move for you. You may be surprised by what you’ll have to move yourself. Have an inventory list for all items moved and label your boxes appropriately. Employees should be moving all of their personal belongings, but the big items like office furniture and other items that are packed away that are owned by you, the business owner, should be included in your inventory system. You should have a basic layout of the new office and a system in place for movers to unload boxes where they need to go. Choosing the right moving company from the start is critical to a successful office move and the best way to mitigate any of the most common office moving mistakes companies make. Couple that with timely moving prep, you are on your way to minimizing downtime and getting back to running your business.